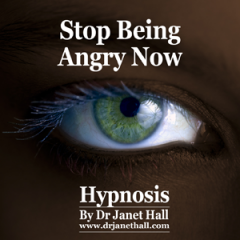 Dr Janet Hall’s “Stop Being Angry Now” audio uses hypnosis to help you break the chain of anger, to simply stop being so angry, and channel that explosive energy into creating a winning outcome and a successful life. When you listen to Dr Janet Hall’s recording, “Stop Being Angry Now” , your subconscious mind will be reprogrammed with positive influence that will safely and naturally enable you to overcome anger tendencies with minimal effort on your part. So, if you’re serious about wanting to stop feeling depressed then you need to get a copy of “Stop Being angry Now With Hypnosis” right now!